When I think coleslaw, I think of either Kentucky Fried Chicken’s version or my Grandpa’s – both delicious. (Does anyone else ever wonder how KFC packs so much coleslaw in such a tiny container?!) And while coleslaw is associated with many childhood memories for me, it’s a side dish I rarely eat as an adult. I mention that as a disclaimer because this recipe from The Yiddish Kitchen is quite good, but I have no idea if it tastes like coleslaw because it’s just been so long since I’ve had the real thing. All of you coleslaw conneusiers will have to let me know how it stacks up! In a large mixing bowl, whisk together all ingredients except cabbage, carrots, and onion. 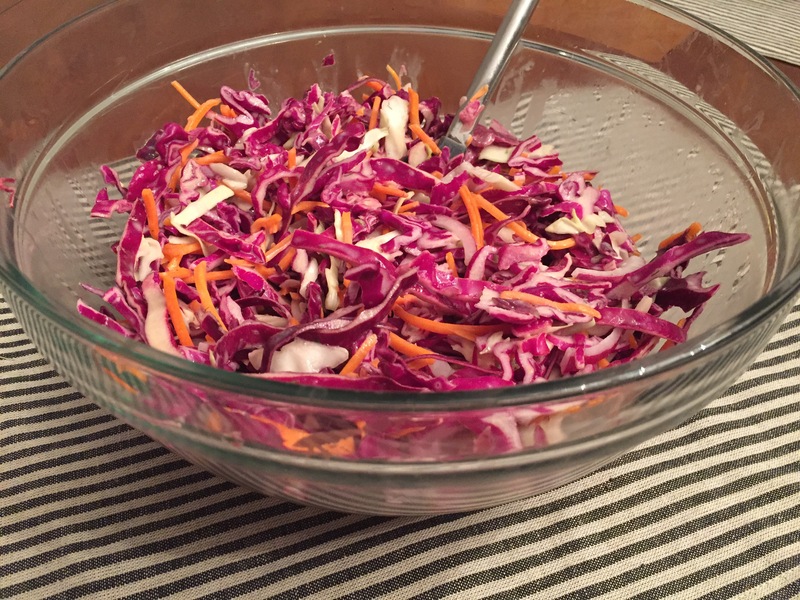 Once dressing is well combine and smooth, toss in cabbage, carrots, and onion. With clean hands, you can also combined with your hands to really help the flavors and juices marry. Enjoy right away or, for the best flavor, let sit overnight covered in the fridge.